Meridian featured in the 2012 Craft Brewers Conference Symposium Ale, Yippee! The buzz is building. Meridian has crossed the Oregon border. 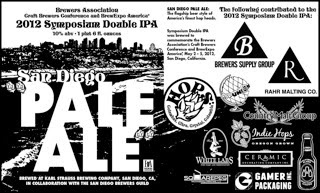 Our friends down in San Diego at Karl Strauss have just bottled up a hop bomb, exploding with flavor, to welcome the thousands of brewers who will celebrate all things crafty at the 2012 Craft Brewers Conference. This bad boy, tongue-in-cheekily monikered as a ho hum “San Diego Pale Ale, which is sort of like calling an MX missile a “bottle rocket,” comes in at a burly 10.2% ABV and 95 IBU. Welcome to San Diego, where it ain’t beer if it doesn't sprout a fully loaded hop vine. A few months ago we sent a brewers cut of Meridian to Paul Segura, the master brewer at Karl Strauss. He took one whiff and spontaneously uttered whilst the eye lids fluttered: “We have got to dry hop our Symposium Ale with this beauty.” And he did, along with his righteously motivated brethren within the San Diego Brewers Guild. This afternoon Chris Cramer, Karl Strauss’ preternaturally cheerful CEO, ordered me to “get down here now” and taste this beauty. Words like “floral,” “aromatic,” “incredible,” "tropical fruity," and “unique” burst forth like fireworks exploding on the Fourth of July. We can’t wait to see our little darling perform on the Big Stage. To be sure, all glory to our friends in Yakima, who furnished the Columbus and Citra for this ruthlessly hopped special release. Indie Hops is overjoyed to have provided the Crystal and Meridian. A funny sidenote – the press release on the San Diego Pale Ale on “The Beer Spot” blog identifies our contribution as “Columbia.” This, my friends, is an honest and totally understandable mistake – we thought it was Columbia too until we did a whole lotta digging, testing, evalutating, measuring, and musing. 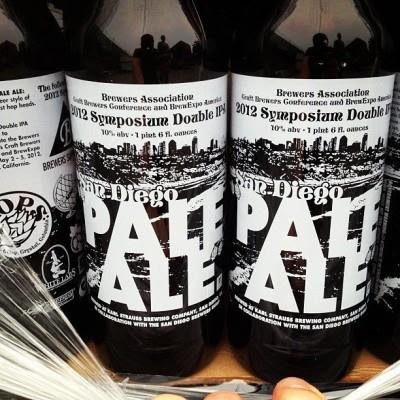 Here’s a picture of the Symposium Double IPA wolf in sheep’s clothing. And here’s a picture of the commemorative poster, including Indie Hops, the little engine that could… Note that the Hops logo (the circle with the cultivars: "Columbus, Citra, Crystal..." also misidentifies our Meridian as "Columbia." Honest mistake, nobody's perfect. Let’s toast to the glory of hops, malt, water, yeast and TLC! Make sure to stop by our booth. Jim, Matt and I may be short on most of our 2011 inventory, but our 2012 harvest is only months away. We appreciate your support and friendship.